The Game has had a lot to say about Joe Budden and his fiancee Cyn Santana recently. 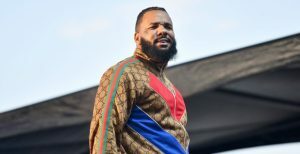 On Sunday night, Game claimed that Joe is threatening to sue him over a song where Game mentions his previous sexual encounters with Cyn Santana. He also claims to have discovered Santana. Joe Budden also had a lot to say on the matter on his podcast. Check out The Game’s latest post below.